I never thought when I came up for the idea of Grayson’s Great Fun Day to raise money would I be met with so much support, I mean I knew SWAN fellow Mama’s would be great, close friends and family, but the support we have received online has been out of this world. 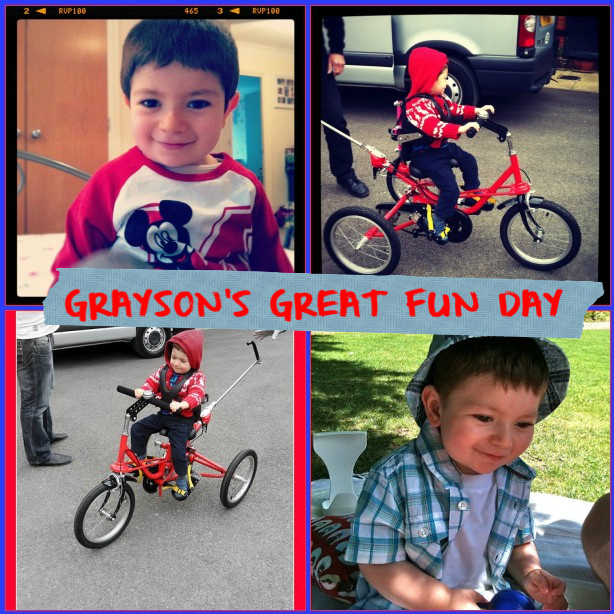 Firstly you have my amazing friend Sonia of Mummy Loves – she is running an auction for Grayson’s Trike which starts on Facebook on April 1st, watch this space, you can go and check out the 100 items that have been donated, there are some crackers. Secondly on the subject above the amazing companies and people, only a handful who actually speak to me that have donated prizes to help my little boy get his trike, I don’t think there is a way I can say Thank You – but Thank You anyway. Thirdly – The gorgeous Becca of Life, Love & Beauty has given up Chocolate till Grayson’s Fun Day, how truly awesome is that, I mean I am not sure I could, please go by and show your support and sponsor Bec in her truly amazing event. Fourthly – All the great friends on twitter and Facebook who keep sharing my links, RT tweets and just spreading the word, to each and every one of you Thank You from me and the boy. Lastly, the following bloggers, not even being asked have done Blog Posts on their Blogs to help raise awareness for the Funday, SWAN Babies and Grayson, each post makes me cry ( I am not kidding) I go back and read them frequently, they make me so thankful to have found Twitter and the beautiful friends I have through it. Go check out all the posts and their beautiful words to my little boy. All this is fantastic but of course, I am going to ask for more, if you want to know about the FUNDAY go take a look, if you would like to help me raise awareness please do a post yourself, April 1st Sonia’s Auction starts for 10 days, please help me spread the word then and lastly if you have a nice donation for our raffles, or little treats for kiddies for the Lucky Dips on the day we greatly would appreciate them, nothing is too Small. So thanks again to all, Grayson, Myself and my Whole Family Thank You.